Do you have a Macbook but are tired of having to delete important files to secure space on the disk? Perhaps there's another way out. Get to know everything about MacClean in this review. Owning a Mac is one thing. Being able to understand its subtleties and appreciate is another and being able to yet manage it properly like a Pro is an entirely different affair. If you are a regular visitor to Apple India's official website, you might discover that the storage space provided in the newer generation laptops is not huge. They don't give you TBs of space for the simple reason that the storage drive that Macbook's pack have almost double to speed of the modern SSDs. You can actually get a transfer rate of a Gigabyte per second. It is obvious that the price of such a technology has got to be huge. There are 128 GB, 256 GB and 512 GB variants of Macbooks and logging on to Apple India's official website will tell you that the price difference between the three variants is not small. In fact, the difference is such that for the difference you can get a new non-Apple laptop, which will be suitable for moderate use. All this to enable a non-Apple use to appreciate the storage space provided in Macbooks! And if you already have a Macbook, you don't require to be explained how precious every byte of storage space is. However, with constant use, like all other operating systems, even Mac computers accumulate unwanted elements, which only occupy space and have no utility. This grime needs to be taken care of or it would mean you're losing valuable storage space for no reason. This is where cleanup utilities come into picture. And as explained earlier, cleaning up Macbooks is vital. 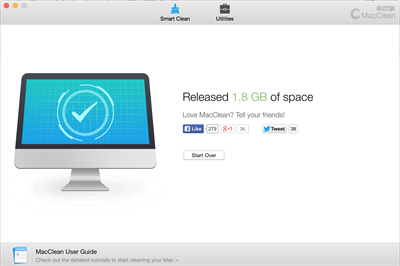 Among a plethora of cleanup utilities available, I give to you – MacClean. It's developed by iMobie and is free for download as of now. Its size is small (at a file-size of 12.3 MB) and it's pretty easy to use. Truth be told, you won't require more than a minute and a few clicks here and there to get used to this tiny thing. So without much ado, let me now jump to its feature set. 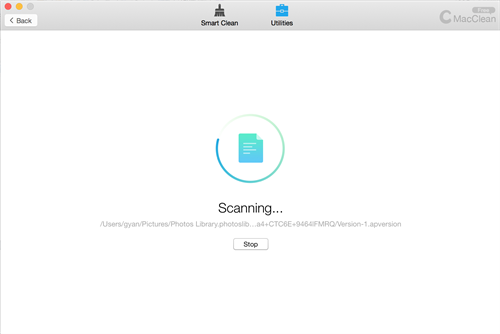 You get to choose to scan your Macbook for getting rid of 6 types of junk files. They include internet junk, user junk, system junk, development, trash and application junk files. If you want to clean them all up (which you actually might want to do), you've got to select all the options and click on the Start Scan button. As you can see, my Macbook has been diagnosed for junk files and now I am cleaning my Macbook. And well, I have saved about 1.8 GBs of space, in my case. And all that took you not more than 90 seconds. Isn't that great. The other tab, besides the Smart Clean app is the Utility tab. It contains 9 types of cleaning utilities, which you can use one by one to clean your Mac the way it suits you. This utility searches for old and large files on your system. You can choose folders and start scanning. To add to that, you can choose among folders which have been chosen by the application for you by default or you can custom select folders by drag and drop feature. 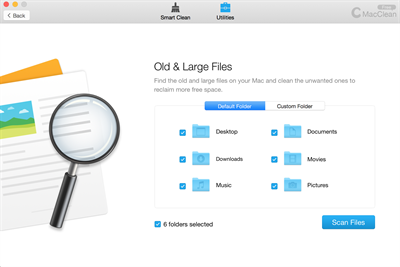 As the name speaks, you this utility feature helps you find all duplicate files on your Mac system and lets you remove the ones you never wanted to have. This one helps you erase files (well that's almost what all the utilities do). You can choose any of the three standards that you want to use to cleanup your Mac. Standard Erase is a data overwriting method, as the application itself mentions. It however warns you of the potential risk associated with using this standard. Safe Erase, as the application says, is a military level erasing method and it overwrites the deleted junk for 7 times. Top Security Erase overwrites data for about 35 times. If you are unaware, iPhoto develops junk files too, while rotating pictures for you to make them viewable. (Yeah that's how smart Mac is). Use this utility to get rid of the junk iPhoto creates. Many apps are multilingual. This utility lets you delete the unwanted language files that multi lingual files bring with them. Use this utility to remove binary junk. As you know it, while you uninstall apps, there are leftovers that the apps leave behind. It is important that you get rid of such unwanted junk because these ones take space. The App Uninstaller that comes with MacClean claims to delete applications without leaving their junk files behind. I believe this is a nice feature. It lets you manage your plugins, addons etc with use. So you don't require a separate app for this. MacClean takes care of it all. 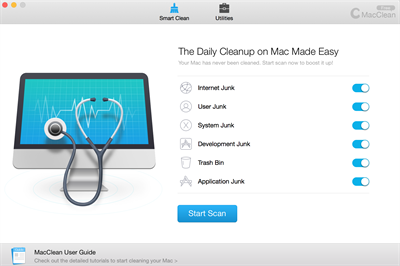 This utility sweeps the Trash in your Mac and assures your files are completely deleted. Add an emphasis on 'completely' when I say it. This is a free app. If you ask me, I don't suppose there are many things that you must expect from an app in the development of which you've not helped in any way but are enjoying all benefits. Owing to the huge competition that each and every app in the Mac App Store faces, app developers are compelled to make their apps a contender in all senses. In my view, this app is a total utility stuff. If you're using Mac (and if you still want to not pay a penny for apps like this), you've got to have this on your Mac. It packs everything into one and gave me nothing to complain about. I was able to save almost 2 GBs of space on my Mac. I'll give it a 5/5 for a free app.